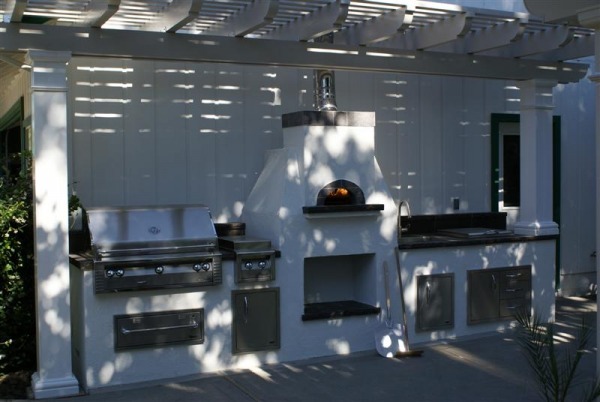 Northern California’s premier Manufacturer of custom outdoor kitchens, BBQ Island grills, residential gas pizza ovens, Fire places, Fire pits and accessories. We are a factory direct BBQ Island company, offering our top of the line products (Viking grills, Alfresco grills, OCI grills and Jenn-Air grills) wholesale to the public, allowing every customer to experience a savings of hundreds to even thousands of dollars! The concept to outdoor kitchens has grown rapidly over the last several years. What started out as a small selection of modest , simple grill cabinet enclosures has grown to a wide variety of stylish, and original designs of islands , fire pits, pizza ovens and every other accessory imaginable, allowing the customer to create their own unique backyard theme. It is the goal of Outdoor Kitchens.info to create a product that is on par with a built-in custom outdoor kitchen constructed in your backyard without the added expense and inconvenience. Virtually all of the construction is performed at our factory, and then delivered to you. The time and care that we put into our projects is what sets us apart from our competitors, and it shows proudly in our finished islands, fire pits, and other accessories. Let Outdoor Kitchen.info be the cornerstone of the backyard oasis only you can design. OutdoorKitchen.info offers outdoor kitchen designs that are unique and the prices are extremly competetive with any factory direct barbeque Island company.